100% lego roller coaster with banked turns, loop, lift and 7 cars. 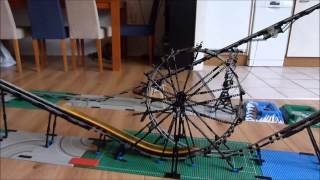 This lego roller coaster is about 5x1x0.8 (lwh) meters big. The train weighs more than 400 grams (without minifigs). It took about 4 to 5 days to make with 3 persons.